This is probably one of the wisest men who ever lived. I think it is time that people learned from the wisdom that he left behind. If they would, the world wouldn’t be destroying itself from within. The origin of all the problems of this world lies within the heart of each individual. We must always look to “fix” ourselves before trying to right the rest of the world. Once done, there will be no need or desire to encroach into another’s realm. Trying to “convert” the world will never work because the spirit of man will always be free and will never submit to the oppression of others–even if they have to talk to their creator in secret. No individual or group will ever dominate the spirit of man because only the creator can decide the destiny of any individual. 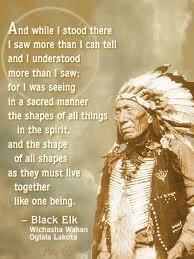 Black Elk knew where freedom lies. It lies within each of us. I just thought I would share that. The freedom to “be” can never be taken from anyone. When we get into that quiet place to where we can each hear that small, still voice inside of ourselves and take direction from it, then will we be able to find what it is we need to do with our time–what is left of it. Time is too short to squander, and very precious. We must make the most of our existence while we are here. Only what we impart to others determines the impact we have on the lives of those us. That is why it is so important to work on ourselves FIRST.